Time for another round of hot or not. There’s no official version or name of the next Android version, just a James Bond reference for now. Anyway, it learned something from iOS – granular permissions. The first time an app needs something it asks for permission, which you get to deny. Google also improved how apps talk to each other and how they integrate web content with Chrome. Android Pay was unveiled, to try and do what Google Wallet couldn’t. The OS officially supports fingerprint sensors and dozes off the save battery when you’re not using the phone. Google Now got smarter with the new On Tap functionality. It understands context – “this”, “it” and so on and you can ask “what’s his real name?” while listening to Skrillex. 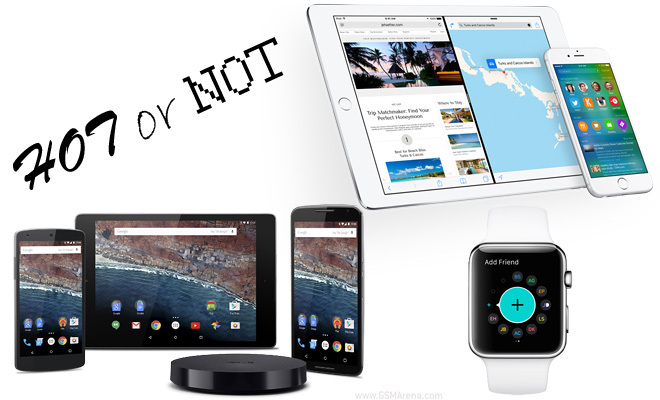 Mobile OSes learn from one another and iOS 9 and Android M are proof of that. iOS 9 brings split-screen multitasking like Windows 8 and TouchWiz on Android have been doing for years. Then Siri got Google Now like functionality and now presages relevant info you might need and shows it in cards. Apple Maps got closer to Android’s app with transit directions and we Apple launched a fleet of cars for Street View type imagery. Additional smaller features include using the keyboard as a trackpad, News replaces Newstand, the Notes app got text formatting skills and Car Play supports better car integration. Not technically part of the OS but Apple’s new Music streaming service caused a lot of commotion too. Very soon after the launch of the Apple Watch the company released version 2.0 of its OS. It tried to spin it as fast progress, but it sounded a bit like bringing functionality that should have been there from launch. The most important change is that the Watch can now run native apps, it doesn’t need a connection to a phone. Chat apps on the watch can send voice messages, Vine can play videos and so on. Native functionality was improved, now spinning the digital crown can give you an overview of your day – what happened and what’s yet to come. Watch faces are now customizable too. While watching the unveiling many features had us saying “Finally!” That’s a good sign in a way, it shows Google and Apple listen to consumers. Still, many of Android’s new features were adopted from maker-customized software (and iOS) while Apple seemed to be making up lost ground in some areas. So, yay or nay?